Oxen with mottled markings stand in the foreground, with a large byre (luak) in the background and one further off to the right. 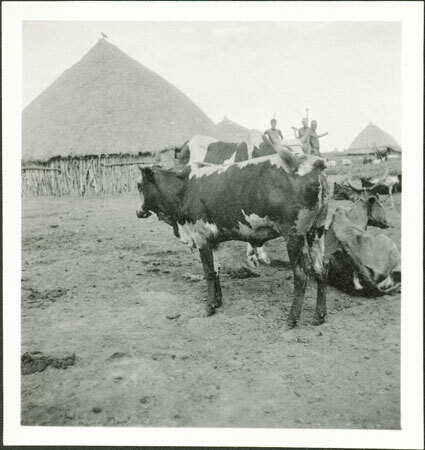 In contrast to his two earlier fieldwork visits in 1930 and 1931 when photographing cattle was viewed suspiciously by the Nuer, Evans-Pritchard took numerous images of them during his later fieldwork during 1935-1936. Note on print reverse ms pencil - "78 2 293"
Morton, Chris. "Nuer cattle markings" Southern Sudan Project (in development). 03 Jan. 2006. Pitt Rivers Museum. <http://southernsudan.prm.ox.ac.uk/details/1998.355.289.2/>.